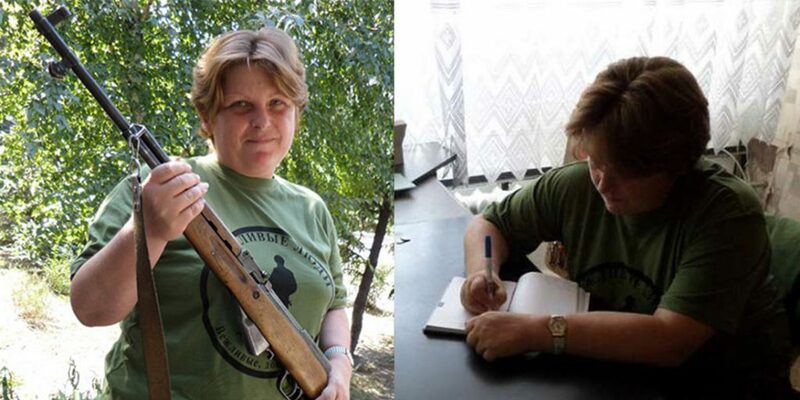 Tatiana Rybalko: Before the war, I worked in the Mariupol steel plant, up to the very moment I was captured. Since 2010 I’d been a member of the Communist Party [of Ukraine, KPU], and was repeatedly re-elected to the post of Secretary of the Party cell, member of the District Committee, Assistant Secretary of the District Committee. In February 2014, I became a leader of the city’s Anti-Fascist Committe. I took part in rallies and protests. Also from April 2014, I was a member of the initiative group of deputies of the Donetsk People’s Republic (DNR) in Mariupol. I became a member of the city commission after the referendum of May 11, 2014. From June until the day of my kidnapping, I collected humanitarian aid (food, clothing, medicines) for our guys who fought in the militia. However, people brought only a little – in the Ukrainian-occupied city, doing this was dangerous. In other words, even under the pressure of Ukrainian nationalists, we continued to fight for people’s power against the Nazis and their henchmen. TR: I went to work on the night shift. Just 10 meters from home a “Gazelle” drove up. Unknown people threw a bag over my head, handcuffed me and dragged me into the car. On the drive, I was badly beaten. We stopped several times, I was taken out, put on my knees and beaten again. “You will be shot.” As I later learned, they were neo-Nazis from the Azov battalion. Then, I was in jail for 56 days. The ratio of inmates to prison guards was normal. I was taken in for questioning by the SBU; they didn’t beat me, but very much psychologically pressured and blackmailed me. TR: After the negotiations in Minsk in December 2014, I was placed on the list for the exchange of prisoners of war. The exchange took place in the area of Yasinovataya (DNR). I want to say a few words about the attitude towards the prisoners.They referred to us as cattle, and even worse. They carried us to the exchange in stuffy buses, shackled in handcuffs and duct taped to the seats. With us on the exchange were four badly wounded militiamen — all the way (which was 20 hours), the guys suffered pain and assistance was not provided to them. Most offensive was that those for whom we were exchanged walked as if coming from a resort, and we were all battered and broken. TR: I find it very hard to talk about this, because I myself was a member of the party, and it is a very painful experience, but the leadership of the Communist Party is a disgrace to the communist movement. I think they kept aloof from the uprising in the Donbass due to corruption of the party leadership and wanting to stay “clean” in the event of the failure of the uprising. Tatiana Rybalko: The opportunity is there — we have a lot of women in the army, and many who want to fight. I think there is a need: Unfortunately, most men have fled to Russia, or they think they do not need to defend their land. Not all of course, I apologize, but there was a degradation of the male population of Donbass. Not all went out to defend their land, their loved ones. Many simply ran away. TR: In the brigade we are treated okay, but again, unfortunately, not by all. And for all of the LC I can’t say. I know one thing, that the army is reluctant to take women, based on the conditions: maximum age of 35 and previous military training. TR: Since I am a Ukrainian (according to the 5th column of the Soviet passports, and since my ancestors were Zaporozhye Cossacks), this is what I’d say. Guys! Our common enemy is sitting in the Verkhovna Rada in Kiev and Washington. Russia is a country that “wiped our noses” and nursed us. Russians, Belarusians and Ukrainians are one people — rusichi !!! You come to our land, kill us, and meanwhile, your home and your family are being sold to Uncle Sam. And the delusions that you are fed, about Greater Ukraine, are pure theater. You do not need to fight with us, but deploy your weapons and go to Kiev to remove the “tick” from your land. Only after the overthrow of the junta (which came to power through an illegal, armed coup) will there be peace in our land. You are driven to the slaughter, you are made into a bargaining chip, but no one helps you if you are wounded, and in the event of your death no one will help your family. Sent to the Donbass, you have been written off. Think! – you’re dying to make Yatsenyuk, Poroshenko, Turchynov, Tymoshenko and others like them in Kiev richer. This entry was posted in Alternative e Socialismo, Articoli e Testi, English, Europa, Popoli e Terre, Russia and tagged Donbass by VOXKOMM. Bookmark the permalink.